"The place won't be the same without him and his death has left a gap. I have already seen a lot of people in tears and we are very upset..."
Some cats have become famous over the years as the result of having found work as a combination of companions, mascots, and mousers at libraries, post offices, police departments, hotels, veterinary offices, restaurants, bars, and all sorts of shops, but far removed from the hustle and bustle of the maddening urban crowds a handful of their brothers and sisters also have secured homes and duties at some of the most unlikely and gloomiest places on earth, i.e., cemeteries. Given that the work is primarily outdoors and involves keeping constant company with the deceased, these jobs are, cela va sans dire, not every cat's cup of catnip. 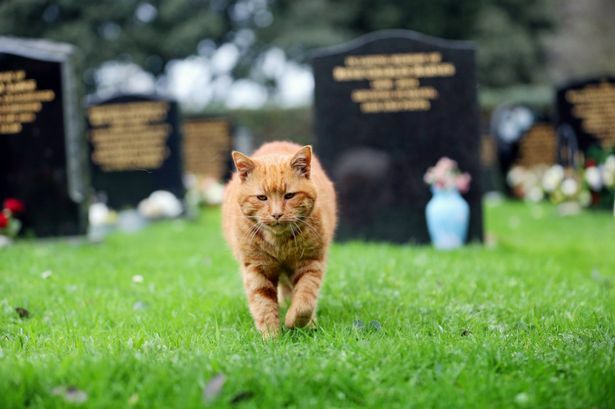 Despite those drawbacks, a ginger-colored tom named Barney was able to somehow eke out such an existence for an astonishing twenty years at St. Sampson's Cemetery in Guernsey. In doing so, he endeared himself to many of the parish's roughly nine-thousand residents by freely dispensing consolation to them after their lives had been irrevocably torn asunder as the result of untimely visits made by the Grim Reaper to the homes of relatives and friends. "He is a much loved and very adorable cat. For those who enter the cemetery with a heavy heart, he lightens the experience for them," the church's longtime sexton, sixty-three-year-old Alan Curzon, told the Guernsey Press of Vale Parish on December 24, 2014. (See "Barney the Cat 'Comforts' Cemetery Visitors.") "When people walk through the gates, he often comes up to them and brushes against them. There is not a bad bone in his body." Although Barney was his same lovable and kindhearted self all year-round, his ministrations were most appreciated by those who were visiting the cemetery at Christmastime. In particular, for those who were saying goodbye to a loved one he, according to Curzon, made such somber occasions "slightly more bearable." Visitors and parishioners alike responded in kind by leaving presents for him as a show of appreciation for all that he had done for them. Sadly, all of the consoling, reviving of sagging spirits, and the replacing of sorrow with hope ended forever on March 4th when he, too, finally succumbed to that inevitable fate that no mere mortal has yet to figure out a way of avoiding. The official word from the church is that he simply died of old age. "The place won't be the same without him and his death has left a gap," is how Curzon chose to eulogize him to The Mirror of London on March 5th. 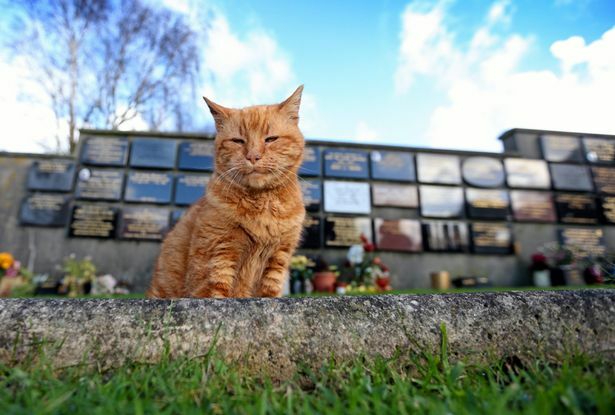 (See "Barney the Cemetery Cat Is Buried in His Own Plot after Providing Comfort for Mourners for Twenty Years.") "I have already seen a lot of people in tears and we are very upset..."
In addition to his other duties, Barney also was a regular at graveside services. "I think the presence of Barney brought a lot of comfort to so many people. Whenever I was taking a funeral up there families were so happy to see Barney milling about," the Reverend Timothy Dack, rector of St. Sampson's Church, recalled to The Mirror. "The mourners would see him and it would bring them a lot of joy. I just think he gave great comfort." The eulogies that have poured in following the announcement of Barney's death have by no means been limited to the clergy and staff of St. Sampson's Church but rather parishioners also have gone online in order to both fondly remember him and to express their heartfelt condolences. "God bless you Barney, remember that lovely sunny afternoon, I laid down on the grass in the cemetery and we cuddled up together for two hours," Debbie Ann Le Page wrote on Facebook according to the account rendered in The Mirror. "I needed a friend that day and there you were my angel!" 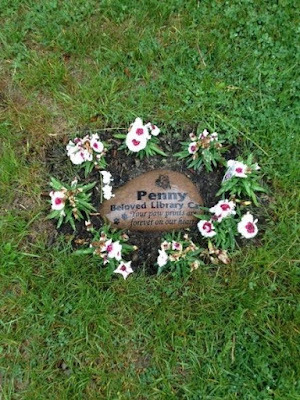 Other residents of the parish took comfort simply knowing that he was watching over the graves of those who had departed. "I always felt my young daughter was never alone when he was there," Sue Falla wrote on Facebook. "Really going to miss you, Barney, requiescat in pace." Although the church was shamefully remiss in neglecting to provide Barney with a memorial service, it did have enough respect and love for him that it, apparently, did refrain from adopting the expedient of having his remains incinerated. Instead, they are buried on the very same grounds that he trod upon for a fifth of a century. That magnanimous decision was fully supported by the parishioners. "He should have his very own little grave there as this was his chosen place while alive," Andy Baker wrote on Facebook. "He should be laid to rest there." It was Mandy Hardman, however, who put the case for burying him in the cemetery most succinctly. "He belongs there," she wrote on Facebook. Whereas the church has not disclosed if it is planning on providing him with a tombstone, failing to do so could only be construed as disrespectful and ungrateful. Like everyone else buried there, he is richly deserving of a proper gravesite where parishioners and tourists alike could visit, pay their respects, and leave behind flowers, kibble, and tins of tuna just as they do to this very day at the bronze statue of Samuel Johnson's beloved cat, Hodge, at 17 Gough Street in London. All that Curzon has revealed is that the church is planning on erecting plagues on both a wall and a bench, presumably in the burial ground itself, in his memory but he most assuredly deserves a far more fitting monument after all that he did for the church and community. Plus, he is unquestionably the cemetery's most famous resident. As it, lamentably, is often the case with so many cats, Barney had a rather rude introduction to this wicked old world. 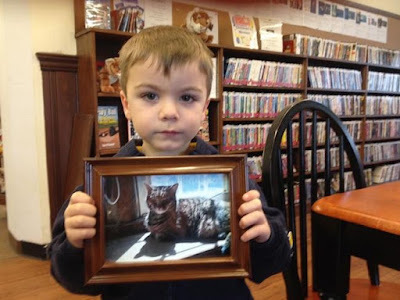 In particular, his original owners, who resided next door to the cemetery, cruelly moved away and left him behind while he was still just a kitten. With no other prospects in sight, he kept returning to the cemetery before settling in there on a permanent basis in 1996. Not a great deal is known concerning the quality of care that he received from St. Sampson's Church. All that has been disclosed is that Curzon and some of the parishioners did feed and water him but how often, plentiful, and nutritious the fare remains a closely guarded secret. For whatever it is worth, Curzon insists that he led the life of Riley. "He did not have to worry about a thing, but I must stress it was not just me looking after him," he told The Mirror. "There were a lot of people that took him to their hearts." 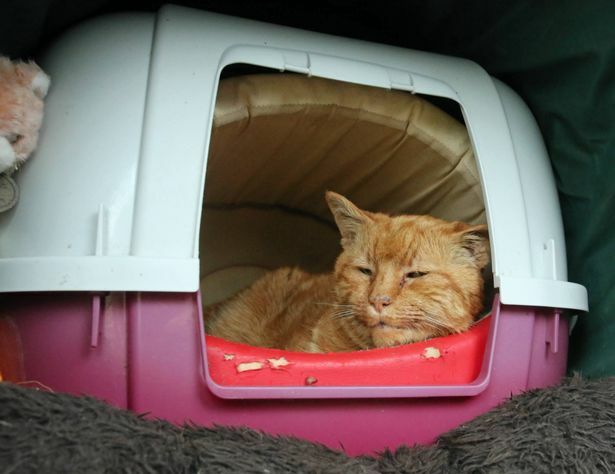 The church also provided him with a shelter of some sort but it is believed that consisted of only an insulated pet carrier that was tucked away inside of an overturned plastic trash can. A door mat was placed out front but the cage itself was left open in the front where it was constantly exposed to the elements. The good news is that since Guernsey is located in the Channel Islands just off the coast of Normandy, it enjoys a rather mild climate with nighttime lows rarely dropping below the freezing point and daytime highs seldom climbing above the 70° Fahrenheit barrier. It is, however, rather rainy November through January and the island is sometimes buffeted by cold Arctic winds that can make conditions outside feel like it is considerably colder than 32° Fahrenheit. 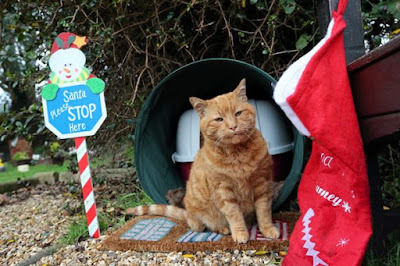 That is by no means the most inhospitable climate in the world but at the same time it is far from being ideal, especially for a cat that was forced to spend all of his days and nights outdoors. "He had his own house but he would spend his days wandering around," Curzon told The Mirror. "If he heard a car coming he would make himself known and was so friendly." That is not surprising in that no cat desires to live its life inside a cage, especially one that is cold and wet. It is even doubtful that Curzon endeavored to so much as change his bedding once it became saturated with water. Curzon may have been around during the daytime when he was on duty and an occasional visitor may have wandered in once in a while but for a lion's share of the time Barney was left to his own devices not only to deal with his social isolation but also to ward off juvenile miscreants, dogs, and others intent upon doing him harm. In that regard, his fate is reminiscent of that which befell a brown-colored tom with black stripes and yellow eyes named Nelson who was cruelly condemned to tough it out on the violent docks of Seaham Harbor in County Durham for fifteen long and hellish years. Instead of cruelly condemning Barney to face both the elements and predators all by his lonesome, someone at St. Sampson's should have provided him with a safe and warm home. Failing that, the church should at the very least have allowed him to sleep inside at night. Press reports fail to mention if the church provided him with any sort of veterinary care but if it was too cheap to have done that much for him it is doubtful that either Curzon or anyone else cared enough in order to have either brushed his coat, removed parasites from his fur, or attended to minor injuries. Contrary to what an awful lot of individuals fervently believe, the proper care of a cat entails considerably more than occasionally setting out cheap kibble and tap water for it to consume so that it can somehow stave off immediate starvation. Besides, such acts of beau geste are invariably undertaken for reasons of ego gratification with comparatively little regard for the well-being of the cat. Curzon, Dack, and other residents of St. Sampson's Parish therefore can shout their abiding love for Barney from the rooftops until the cows come home but their abject neglect of him points to an altogether different conclusion. C'est-à-dire, they milked him for everything that he was worth while simultaneously barely bothering to reciprocate in a compassionate fashion at all. In spite of all of those glaring omissions in the church's care of him, the fact that Barney was able to tough it out at the cemetery for so long strongly implies that Curzon and the parishioners surely must have been doing something right. On the other hand, it is entirely conceivable that he owed his good fortune, not to the church, but rather to an environment that was relatively free of both animal and human predators. As far as the former are concerned, dogs, birds of prey and, in North America, raccoons, coyotes, and fishers take an alarming toll on cats. In regard to the latter, it is chiefly motorists who kill cats and they sans doute do so deliberately and for fun. Since absolutely no one from the church was watching out for him, Barney's longevity is one indication that vehicular traffic in and around the cemetery surely must be sparse. Additionally, his original owners may have had him sterilized and that likely significantly curtailed his roaming. An environment that was free of such prolific cat killers as ornithologists, wildlife biologists, Animal Control officers, and representatives of PETA also would have augured well for his survival. The same logic is equally applicable to private citizens who make careers out of poisoning, shooting, and stealing cats. Quite obviously, St. Sampson's Parish is a far more cat-friendly area than any comparable city in the thoroughly lawless and morally bankrupt United States where almost any form of cruelty, no matter how heinous, is not only simply accepted by the hoi polloi but sanctified by the country's shamefully corrupt political and legal establishment. As far as Barney's death is concerned, there is not any obvious reason to question the church's version of events. That is by no means meant to imply that Christians have either a more abiding respect for the sanctity of feline lives than non-believers or that they are any more honest and truthful than, say, politicians and Bauernfängers. Rather, St. Sampson's decision to allow Barney to live out his life to the very end likely was rooted in the legendary cheapness of Christians. After all, confirmed cheapskates who truly believe that they should be patted on the back for handing out stale peanut butter and jelly sandwiches and thimblefuls of Kool-Aid®, which they received from the government no less, to the poor is not about to pay a veterinarian to whack a cat. Like the Jews, Christians only champion the cause of the poor so that they can exploit them. "Nicht ihre Menschenliebe, sondern die Ohnmacht ihrer Menschenliebe hindert die Christen von heute, uns -- zu verbrennen," is how Friedrich Nietzsche put it in his 1886 work, Janseits von Gut und Böse. (Aphorismus einhundertvier). Besides being hypocritical and self-serving, the drivel served up by both groups of fraudsters serves only to foster a culture of subservience and poverty. "...Christianity, with its emphasis on humility and the hope for a happier afterlife, was clearly a religion for slaves and poor people," Edward Rutherfurd observed in his 1997 historical novel, London. The Christians' abuse of cats, other animals, and Mother Earth is even more pronounced than their mistreatment of their fellow humans and that is so much the case that it can only be characterized as patently immoral and criminal. Specifically, their outrageous and totally unforgivable crime spree against the animals and Mother Earth began when they fell hook, line, and sinker for the Jews' morally repugnant theology contained in Genesis 1:26-28, Acts 10:9-13, and the Book of Revelation. Armed with such sottise, Pope Gregory IX denounced black cats as satanic in a papal bull issued in 1233. Later in the fifteenth century, Pope Innocent VIII followed his lead by issuing his infamous witch bull which declared that all cat worshipers, and by implication all cats as well, should be disposed of via the auto-da-fé. Even more damning, very few clergymen, with the notable exception of Anglican priest Ralph Inge, have been willing to even acknowledge the commission of such heinous crimes. "We have enslaved the rest of the animal creation, and have treated our distant cousins in fur and feathers so badly that beyond doubt, if they were able to formulate a religion, they would depict the devil in human form," he declared in his 1922 book, Outspoken Essays. Guernsey itself is by no means any stranger to the hideous crimes perpetrated by the Catholic Church against the indigenous people of Europe. In point of fact, both the island's patron saint as well as the parish in which Barney resided for so many years are named in honor of Samson (sic) of Dol-de-Bretagne who forcibly converted the inhabitants to Christianity during the sixth century. It is a bit difficult to unearth the historical particulars but if the Catholics followed the same methodologies in subduing Guernsey that they did elsewhere across Europe, they eradicated wholesale numbers of both non-believers and cats as well. Moreover, the Catholics were not only brutal but thorough as well in that the only known so-called pagan manuscripts to have survived their purges were Beowulf in England, the Nibelungenlied in Deutschland, and the Younger Edda and the Elder Edda in Iceland. Once the followers of St. Sampson had polished off those who still believed in the Norse gods they quickly turned their attention to Protestants and as a result Catherine Cauchés and her two daughters, Perotine Massey and Guillemine Gilbert, were burned at the stake on July 18, 1556 during the Marian (Queen Mary I) Persecutions. The gory details are nothing short of horrifying. Although the usual procedure called for the condemned to be strangled before being burned, on that occasion the cord broke and as a result the women were cast into the flames while still very much alive. Even more shocking, after the flames had reached Massey her stomach broke open and out popped an infant boy. 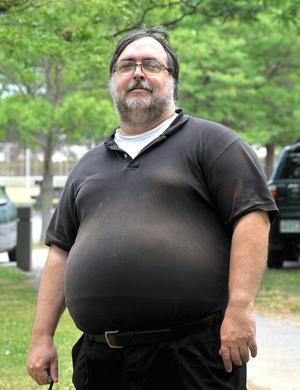 A bystander rescued him from the fire but the bailiff, Hellier Gosselin, ordered that he be tossed back into the pyre where he, too, perished alongside his mother, aunt, and grandmother. Quite obviously, the Vatican's outrage over abortions is not only a fairly recent contrivance but it historically did not even apply to the unborn children of those that it considered to be heretics. Furthermore, even though "Bloody Mary's" father, King Henry VIII, had taken the Church of England out from underneath the yoke of the Vatican in 1534, that made absolutely no difference as far as the fate of these three women and one unborn child were concerned. The Catholic Church no longer liquidates dissenters but the same most definitely cannot be said for its abhorrent mistreatment and neglect of cats and other animals. Of late, however, Jorge Mario Bergoglio has signaled that it is at least willing to consider inching away from the Dominion Mandate. What, if any, concrete steps that he is going to be willing to take in order to save the animals is unclear. What is needed, however, is for him and the church to make a clean break once and for all time from their Jewish brethren and to declare in no uncertain terms that all animal abuse, exploitation, and killing is immoral. Even if, against all odds, he should be willing to take such a giant step, he is going to face stiff opposition. For example, at the United States Meat Animal Research Center in Clay Center, Nebraska, scientists are in the process of committing seemingly every diabolical atrocity known to man in order to re-engineer cows, pigs, sheep, and other animals so as to, inter alia, force them to grow fatter and to give birth to larger litters. The crimes that are committed against animals by vivisectors, factory farmers, animal shelters, veterinarians, hunters, the imperialist war machines of the Yanks and Jews, and phony-baloney conservationists such as ornithologists and wildlife biologists are several million times worse than anything that goes on inside abortion clinics and yet both Catholics and Protestants alike do not have a problem with the former. Contrary to what the Vatican claims, it most definitely is not pro-life; rather, its morality is strictly limited to belatedly being pro-fetus. In addition to the fundamental problem that the Vatican's behavior seldom, if ever, matches its rhetoric, it also has a disturbing tendency for taking ten steps backwards for every one that it takes in the opposite direction. For example, when Bergoglio was in Washington last September he not only held a clandestine meeting with anti-homosexual rabble-rouser Kim Davis of Kentucky but also canonized Father Junipero Serra, an eighteenth century Franciscan, who has been accused of, inter alia, mistreating, expelling, and forcibly converting Native Americans in California to Catholicism. Plus ça change, plus c'est la même chose. Although St. Sampson's has not said one way or the other if it is planning on acquiring a replacement for Barney, that likely is not in the cards. Besides, during his tenure he became pretty much indispensable and irreplaceable. Nonetheless, with him now gone there will not be anyone to console the bereaved in quite the same way that he did for so very long. "When relatives and friends have suffered the awful loss of someone close to them and go to visit a cemetery they are not in the best frame of mind but Barney was always there to cheer them up," Curzon explained to The Mirror. No matter how hard modern man attempts to first rationalize and then curtly dismiss such events, there simply is not any way of getting around the reality that there is something profoundly sad about the death of a cat. That is not only attributable to their brief life-expectancies and the total lack of understanding and appreciation that they receive while alive, but it also lies in knowing that they will not be coming back in either this world or ten-thousand worlds in the future. With their young minds unpolluted by the blatant lies so profusely disseminated by the Platonists, Jews, Christians, and rationalists in the universities, the Norsemen and the presocratic Greeks understood that only too well. Along with that they also knew that although existence could be beautiful and joyful, it also had its ugly and heartbreaking side as well. Perhaps most important of all, the Norse were fully cognizant that both they and their gods, who also were mortal, were doomed. Yet, they fought valiantly to the bitter end when the Catholics finally subdued and exterminated them and in the process nearly succeeded in completely erasing not only any memory that they had so much as existed but their dark and terrifying truths as well. Although they and their culture were consigned to the dust bin of history long ago, the special relationship that they had with cats refuses to die and given that the roines, as the inhabitants of St. Sampson's Parish are known, were so willing to open up their hearts to Barney it is entirely possible that a few precious drops of residual Norse blood still flows in their aged veins. "All our family loved you so very much and we will always be so grateful of the comfort you gave us at what can be a difficult place," Kelly Ogier said of Barney on Facebook. "You brought sunshine to us and we will love you forever." Well, perhaps at least until both she and St. Sampson's Cemetery join him in the great void. In the final analysis, however, that is not such a bad deal. It simply means that wonderful cats like him should be loved, treasured, and revered for every day that they are here because tomorrow is not guaranteed to any creature and life after death is only a gimmick concocted by the Christians in order to line their pockets, enslave the naïve, and to excuse the detestable crimes that they persist in committing here in the present. Photos: Small World News Service via The Mirror. 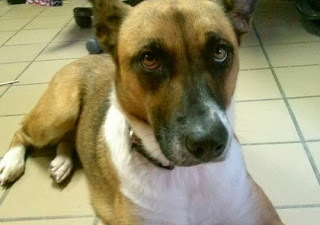 "She has made a complete recovery and is such a happy and loving girl. She's such a wonderful companion." It is not known how it all began for Freckles. She either could have been born without a home and thereafter unjustly and inhumanely incarcerated by an Animal Control officer or she may have had at one time a family who later dumped her at the Knox-Whitley Animal Shelter (KWAS). Her friendly and sociable demeanor tends to lend credence to the latter explanation but either way her past history made little difference when at 9:45 p.m. on November 29, 2013 a deadly fire broke out at the facility located in the heart of coal country in Rockholds, Kentucky. That is because on that hellish night she was just one of thirty-seven helpless felines who were inexcusably left locked in their cages to be either burned, suffocated, or crushed to death by the flames, smoke, and disintegrating walls and roof. There was considerable discrepancy in press reports at that time but somewhere between twenty-nine and thirty-four of Freckles' fellow felines perished. Somehow the one-year-old tortoiseshell survived the fire but even then she was cruelly condemned to spend the following six days trapped in her cage and licking her injuries. In addition to those miseries, she had neither food, water, nor even clean air to breathe. Sooner or later she, too, would have succumbed to either her extensive burns or a lack of sustenance if it had not been for an unidentified insurance investigator who just happened to accidentally stumble upon her on December 5th while sifting through the rubble of the burned-out shelter in search of clues as to the origin of the conflagration. 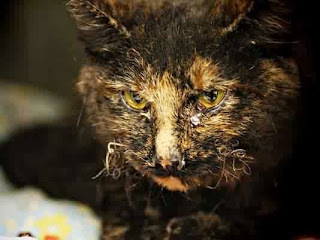 She immediately was rushed to the Lexington Humane Society (LHS), one-hundred-sixty-two kilometers to the north in the metropolis of the same name, where she was diagnosed to be suffering from an upper respiratory infection, burned paws and pads, and singed fur and whiskers. Since she had gone without replenishment of any sort for a week, she also was understandably dehydrated and malnourished. The important thing, however, was that she amazingly was still alive. "She's in serious, but stable condition," Teresa Martin, a volunteer at KWAS, told WBIR-TV of Knoxville on December 6th. (See "Cat Found Alive in Rubble One Week after Animal Shelter Fire.") "Her will to survive is just amazing." At LHS, Freckles' burns were attended to and she was treated with hydrotherapy but, sadly, all of her claws, both front and rear, had to be surgically removed. In time her fur and whiskers grew back and the pads on her feet healed. "She is a very sweet cat after everything she has been through (and) we are amazed she is alive," the shelter's Ashley Holder told WKYT-TV of Lexington on December 5th. 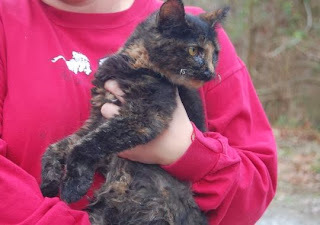 (See "Cat Pulled from the Rubble of Knox-Whitley Animal Shelter.") "Having her here is just wonderful, all of our hearts are filled with joy. We are so glad that she made it through this devastating time." Holder was by no means the only employee of LHS that Freckles charmed with her sweet disposition and unconquerable will to live in the face of such herculean odds against her. Most notably, her colleague Emily Tolliver was so smitten with her that she simply could not let go of her. As a consequence, Freckles has been residing with her and her two-year-old son, a pair of cats, and two dogs since early in 2014. Best of all, she has made a good recovery and is able to get around well despite not having any claws. The only obvious drawback is that she likely is confined exclusively indoors these days because without any claws she would be unable to either defend herself or to scale heights in order to elude both animals and humans intent upon doing her harm. It additionally would be almost impossible for her to hunt under such circumstances but since she now has a loving provider that is no longer a necessity. "She has made a complete recovery and is such a happy and loving girl," Tolliver proclaimed in an August 4, 2015 e-mail letter. "She's such a wonderful companion." Freckles' traumatic journey from death row to the grave only to be ultimately resurrected like a phoenix from the ashes and to find happiness as one of Tolliver's beloved resident felines can only be described as miraculous. Whether she lives for either twenty more years or a scant twenty minutes, she unquestionably richly deserves every solitary second of her new lease on life. All of that aside, numerous questions concerning the fire remain unaddressed to this very day. First of all, the discrepancy in the number of feline fatalities never has been explained. Since all institutions of this sort are supposedly required by law to maintain records of all the animals that they take in, it is inexplicable that KWAS did not know exactly how many cats had perished in the blaze. Secondly, almost nothing has been revealed concerning the origin of the blaze. All that can be deduced from the available information is that since the insurance company ended up paying the shelter $225,000, the fire likely was not set by an employee. Thirdly, it is not known if either of the shelter's two paid employees or any of its volunteers and foster parents were on duty at the time that the fire erupted. Since it got so quickly out of hand the logical explanation would seem to be that the animals had been left unattended. An unidentified individual eventually did notify local firefighters, most likely members of the Rockholds Volunteer Fire Department, who arrived on the scene and doused the flames. Press reports later claimed that the firemen and an unspecified number of volunteers from the shelter attempted to rescue some of the cats. That contingent most definitely did not include Martin, however, who only learned of the carnage when she arrived for work the following morning. The nature and extent of the rescue attempt is of paramount importance because although twenty-nine or more cats perished, only one of the twenty-five dogs housed at the facility died in the blaze. Ironically, the victim was the shelter's mascot, Sassy. 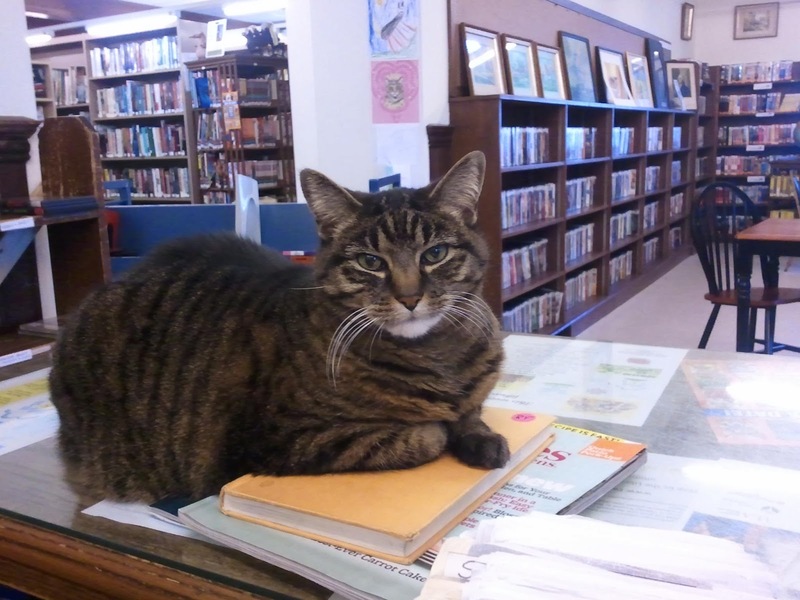 "(She) greeted everyone who would come in. She would go to nursing homes. She would go to all the events," Martin told WBIR-TV of Knoxville on December 2, 2013. 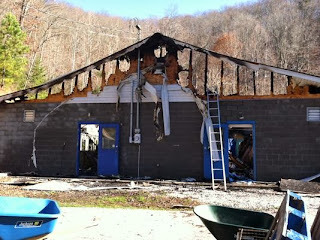 (See "Animal Shelter Looking for Temporary Home after Devastating Fire.") 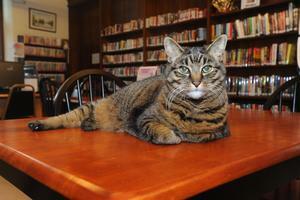 "She was the ambassador for the Knox-Whitley Animal Shelter." For whatever it is worth, Martin attributes the disproportionate number of feline fatalities to the fact that they were incarcerated in an interior room at the shelter and that the roof collapsed on rescuers before they were able to release them from their cages. Although the firefighters can be excused for not being familiar with the layout of the facility, the volunteers should have had enough bon sens to have gotten the cats out first. More to the point, it is not only conceivable but highly probable as well that long-standing, institutionalized prejudices against the species also played a significant role in the volunteers' decision to let them burn to death. For instance, it is well-documented that shelters exterminate a far disproportionate number of cats than they do dogs. It accordingly is easy to understand how that such ingrained biases against the species could have resulted in a laissez-faire attitude toward saving their lives on the night of the fire. It additionally is conceivable that the volunteers viewed the blaze as a godsend in that it relieved them of the job of whacking them. That analysis is buttressed by the disgracefully criminal conduct of shelter employees in the aftermath of the disaster. Specifically, although it surely must have crossed their twisted minds that some of the cats had lived through the inferno, none of them ever bothered to reenter the facility in order to check their cages for survivors. Press reports claim that they were not permitted to do so but they at the same time fail to mention either who or what authority issued that ridiculous edict. In the end the point is moot because the saving of lives, those of cats included, always trumps all legal proclamations to the contrary. Besides, the remnants of the shelter that were left standing do not appear to have been in imminent danger of collapse. 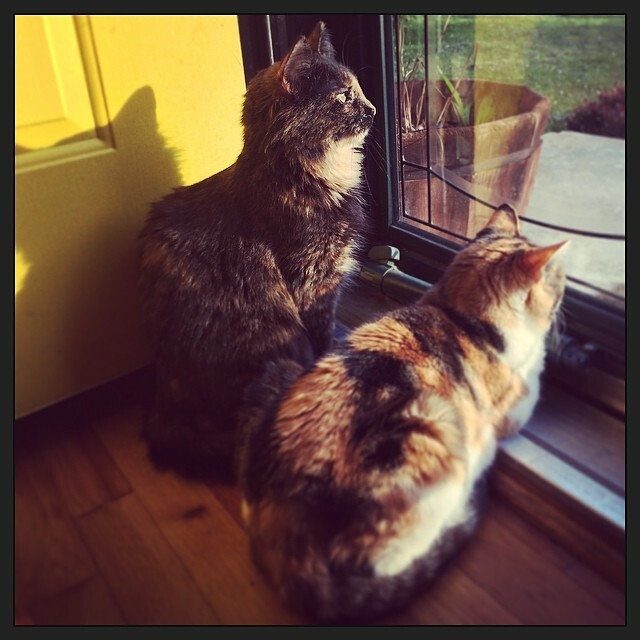 Furthermore, if the insurance investigator, who was unfamiliar with the premises, was brave enough to have ventured inside in order to collect evidence, staffers who most certainly knew their way around did not have anything even remotely approaching a valid excuse for refusing to reenter the facility in order to search for feline survivors. If any of them had been willing to have done so, they not only would have found Freckles and thus spared her from being forced to spend a week with the Grim Reaper's icy fingers tightly clutched around her parched throat. Every bit as importantly, they also conceivably could have saved the lives of many other cats as well. Instead, these callous rotters left the cats to die slow and agonizing deaths while still locked in their cages. The pain and torments that they were subjected to during and after the conflagration are almost too horrible to even contemplate. "I hate that animals had to suffer that way," Kenneth Cumpston of Corbin, sixteen kilometers north of Rockholds, told WBIR-TV in the December 2nd article cited supra. "It's just a horrible way to go, stuck in the fire." Although absolutely no one even remotely connected with KWAS would agree with her, Virginia Thompson of Rockholds put the entire deplorable situation into the proper moral perspective. "I think an animal's life is (as) precious as a person's and I think that was a horrible, horrible death," she averred to WBIR-TV. The needless deaths of these cats also constituted the very epitome of animal cruelty and gross negligence. Consequently, if there were so much as an ounce of justice to be found in this world staffers would have been promptly indicted on multiple charges and forced to stand in the dock. If convicted and sentenced, they additionally should have received lifetime bans on working in the animal protection field. The only humane and morally acceptable alternative therefore is not to allow any of these wretched institutions ever to get their hands on cats. Instead, all resources should be diverted to sterilization efforts, TNR colonies, temporary sanctuaries and, above all, finding homes for all of those that are homeless. In its defense, LHS claims on its web site that it adopts out almost five-thousand animals a year and has a save rate of ninety-five per cent. 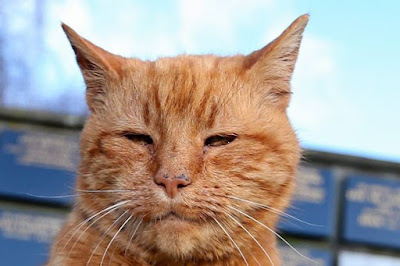 Even though it did a simply outstanding job of rescuing, treating, and placing Freckles, its claims cannot be taken at face value simply because most shelters utilize far too many dodges in order to conceal the carnage that they inflict upon cats. 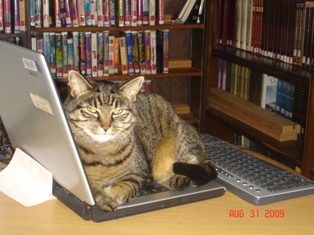 Most staffers at these facilities and their affiliated Animal Control officers engage in such wholesale dishonesty and double-talk that in order to even begin to accurately evaluate any of them firsthand, eyewitness data as to the number of cats impounded, what, if any treatment they might require and receive and, most importantly, their ultimate disposition must be known and that knowledge is well beyond the reach of the average citizen. Moreover, these institutions seldom, if ever, are subjected to surprise inspections by either governmental or private concerns. The LHS accordingly could be telling the truth about its kill rate but the nature of the animal sheltering business mitigates against that being the case. Besides, even a kill rate of five per cent is still five per cent too high. Outrageously, the same old hacks who irresponsibly sentenced all of those cats to die back in 2013 are still running the show instead of being behind bars, which is only what they so richly deserve. Even more deplorably, since the new facility can only accommodate a grand total of one-hundred cats and dogs, they could not possibly be operating anything other than a feline extermination camp in disguise. Residents of Appalachia have had a long and enduring love affair with king coal despite the disturbing reality that a lopsided proportion of the benefits derived from its extraction from the ground always have accrued to those who have owned the mining companies. Generation after generation of miners, their families, and other residents of the area have been felled by emphysema, black lung, and rock lung while of late the tops of more than four-hundred mountains have been blown off in the search for this valuable, albeit carcinogenic, mineral. Moreover, the region has some of the poorest performing public schools and health care facilities in the nation. No one either inside or outside the region gives so much as a hoot, but the same is equally true of its animal shelters, especially KWAS. None of that is about to change, however, because Kentuckians, like most Americans, love only money. Given that Freckles owes her salvation to a real-life, latter-day Johnny Dollar, the LHS, and Tolliver, it can only be concluded that she is alive today not because of anything that KWAS ever did for her but rather in spite of its best efforts to the contrary. It is almost needless to point out that the tens of thousands of cats who are destined to pass through the portals of its latest incarnation over the course of the next several years will not be anywhere nearly as fortunate. Photos: Emily Tolliver of the Lexington Humane Society (Freckles), WBIR-TV (burned-out shelter), and the Knox-Whitley Animal Shelter (Sassy).